Young shelling beans — available at farmers’ markets throughout the summer months — are the big deal here, cooked until completely tender and dressed warm, so they soak up the sharp Champagne vinaigrette. You can use different varieties of beans; just be sure to cook them separately, as the cooking time will vary with their size. Make the vinaigrette: Combine everything but the oil in a small bowl. Gradually whisk in the oil until emulsified. Set aside. Make the salad: Bring a small pot of water to a boil and drop in the shelling beans. Lower the heat to a gentle boil and cook until completely tender, about 12 to 15 minutes. Taste the beans to be sure they’re ready before you drain them. Drain and toss in a large bowl with half of the vinaigrette and sprinkle lightly with salt and pepper. Set aside to cool. Bring a medium-size pot of water to a boil and salt lightly. Cook the fresh beans separately, allowing 2 to 3 minutes for green beans, 4 to 6 minutes for yellow wax, and 6 to 8 minutes for large Romano beans. Scoop them from the water with a strainer; rinse under cold water and drain. Toss the fresh beans into the shelling beans along with the remaining vinaigrette and the herbs. Just before serving, add the tomatoes and season to taste with salt, pepper, and a splash of vinegar, if needed. 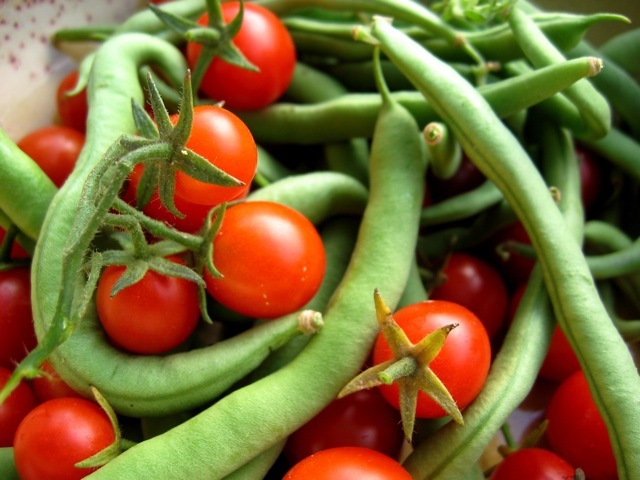 If shelling beans aren’t available, just make the salad without them and increase the cherry tomatoes to a full cup.